Talk in 9 cities, about the world and education. For the community of Non-Confessional Ethics teachers. I thank the inspection for inviting me here to give a lecture on the world and education. I want to use this opportunity to offer some hope to those who feel education is losing its soul, and to make a call to action for a special WELT project we want to expand from Antwerp to the whole of Flanders and Brussels to answer this widely felt loss of purpose. 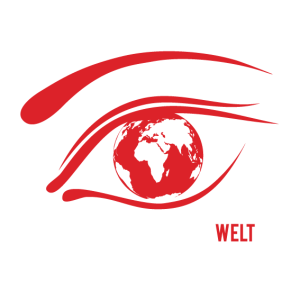 WELT is short for World Education Learning for the Future. It is the first integral program to transform schools into extended schools for world-citizens, using a special kind of cross-curricular project teaching of which the method is not unfamiliar to ethics teachers. WELT already became part of the plans for the optional course Active Citizenship in the public school-system GO! and was recently integrated in the Antwerp city school-system’s policies for citizenship. Yet, to make sure this upscale will succeed, more is needed. That’s why at the end of my talk I will say more about that special project called Youth City Hall. First I will explain why we find ourselves in a world historical crisis that overlaps with the crisis of democracy – since out of that analysis come the first indicators for effective citizenship education. These we will follow when going over the state of affairs in citizenship among Flemish youth. It will quickly become clear how urgently we need to remedy the situation and that much of what today is put forward to do so is far from effective. Two fundamental insights are systematically overlooked in finding effective solutions. They show why without an integral project approach citizenship education will never amount to much on a larger scale. This is the responsibility not of any NGO or individual school, nor of Parliament or the Department of Education, but of the several educational systems in our region. They could disseminate, through their pedagogical services, an effective integral project approach in all schools. WELT was designed to do exactly that and I will illustrate it with an example of one such project, using a couple of scenes of the film made during that project. Hopefully this will inspire you to become the colleague to initiate the program at your school. 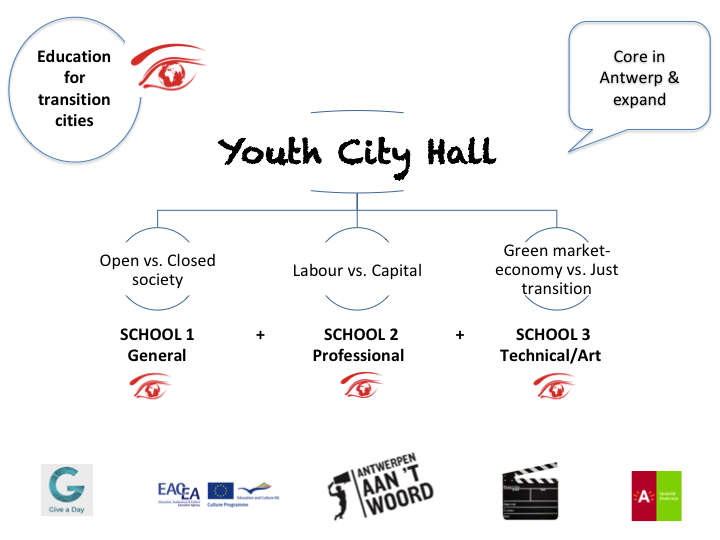 I finish my talk, as promised, saying something more about the Youth City Hall project. In my first part I first want to shortly argue how three huge problems signal the end of the social system we all live in. After that I go into the crisis of democracy somewhat, arguing that next to the rise of populism and the return of the extreme right, the other parties slowly let go of their grand narratives which made most people cynical about politics. To guide democracy through the transition of our world, we need parties that again try to organise around the fractures that divide society. From this follows that citizenship education should be done with a global perspective and be practically organised around the three main fractures of present-day society. There are three huge problems that show why our society is going through a real transition-phase: globalisation, ecological deprivation and inequality. I will go over them in just a few sentences. Long before globalisation theory became popular, Immanuel Wallerstein, the founder of world-systems analysis, already showed globalisation was no new phenomenon. (1) Seen from the perspective of incorporation, Wallerstein could show that globalisation was an integral part of the operation of the modern world-system that already exists for more than five centuries. Equally important was that seen this way globalisation in its current phase announced the structural crisis of this system. Incorporating zones that were not yet part of the world-system, because of cheap labour and resources, was the way capitalists could compensate their losses. This means it was their solution to the higher demands of workers within the system who regularly protested against unemployment and low wages, which in their turn were caused by the recurrent crises of overproduction. One could say that somewhat ironically globalisation theory showed that historical capitalism could no longer function as before, because there are no more zones to be found outside of it. For my purposes it suffices to show how this world historical crisis overlaps with the crisis of democracy. Two things are crucial to note. One. In the seventies unemployment became structural and the attack on social security systems and other public services began. This already was an assault on democracy, but when the last stagnation phase continued scapegoating by extreme right-wing parties became successful again. It were these parties, as Jan Blommaert argues for the Vlaams Blok/Vlaams Belang in Flanders (6), that would incite the other parties with their populist gap between the people and the (left) elite that could only be bridged by a more direct relationship between politicians and voters. And if those voters wanted to limit or reduce human rights, especially those of migrant populations, so be it. The rule of law and the fact that the freedom of speech is not absolute, lost authority. Under the guise of progressive values like gender-equality and secularism – supposedly fully accomplished in our own group – migrants became second-rate citizens in need of forced integration. (7) Those who don’t agree and protest are called otherworldly and are faced with the primacy of politics: once elected no civil society should be allowed to blackmail any government. In times political parties didn’t care too much about ideology anymore, this at least was and is a very clear message. Two. The tendency of parties no longer offering ideological clarity and that way feeding political cynicism, is called centrism. (8) Under the influence of commercial media and the success of new social media many parties would try and seduce the voter with a more personal style and became more like voting-groups. For the left this meant that the demands of economic democracy and social reform were no longer put forward. Centrism allowed neoliberalism to rule in economic thinking and together with the idea that there was no alternative anymore, democratic choice was severely reduced. 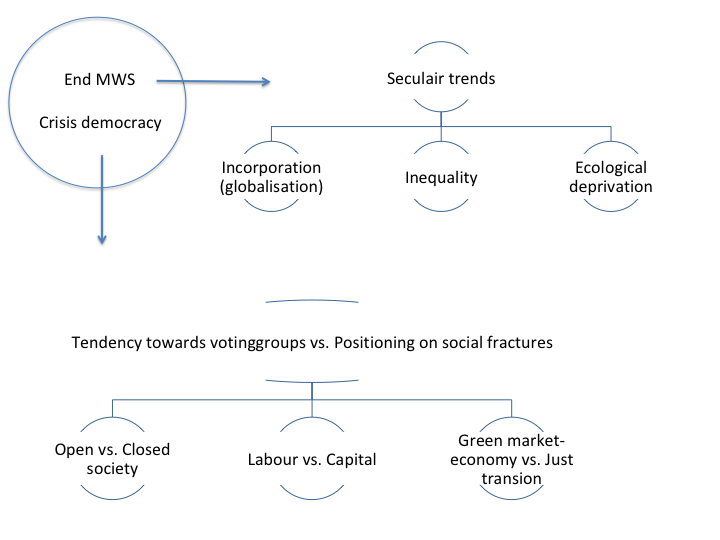 To reverse this trend and try to guide democracy through the transition, we need to realize parties can also organize along societal fractures and starting from group-interests try to convince others with a grand narrative on how to solve the fundamental problems. That would make sure the most important social problems would dominate the political agenda and democratic choice could be restored. There are three such societal fractures. One is between a closed and an open society – where the extreme right with its ethnic nationalism and closed borders already answers the challenges of diversity and globalisation. The second is between capital and labour. The question here is to what extent and how to fight the growing inequality. And the third is the one between a green market-economy and a just transition: does one leave the ecological problem to the market and technology to solve, or does one think government needs to counter the anarchy in production? Transition, crisis of democracy, three fractures. From this analysis we can deduce two things for world-citizenship education. Since the Convention on the Rights of the Child prescribes we educate children for ‘a responsible life in a free society, with respect for human rights and the natural environment’, we have good reason to take the three fractures to focus our attention and structure the knowledge we should transfer. The second thing is that we should teach students to see the problems on those fractures from a global perspective. Since the working definition of world-citizenship is ‘realize that all people live in one and the same unequally developing world-system and that therefore justice is also a global question’. This definition does not include a world-citizen doesn’t want any connection with his own culture or thinks only a world government can solve our problems. That’s but what opponents make of it. Rather, the definition wants to make us think about how to reorganize solidarity and political struggle on the different scales, from the local to the transnational. Next to this, every international study has shown Flemish youth to be at or near the end of the tail when it comes to democratic values and political attitudes. Gender equality scores pretty good but values in the cluster of tolerance often score very poorly. More than once studies show some 50% of our youth to be xenophobic to racist. Furthermore, as among adults, only one in four says to be able to follow politics easily. Even less say to regularly talk about politics, at home or with friends, and still less would ever consider membership of a political party. When one thinks on these data one is not too surprised when a recent study shows upcoming teachers in their first year of teacher training can hardly distinguish between the main ideologies and have serious difficulty understanding events in a wider historical perspective. Of course this state of affairs is not caused by faults in education alone. That much I already wanted to make clear when I spoke about the crisis of democracy. The context for the use of general or civic knowledge is simply crumbling. But it is also clear education can and should do better. Since more than a decade ministers, parliament and executives of education systems have already taken measures to improve the situation. Pretty much all are well intended. But encyclopaedic transversal end-terms or in the curriculum scaled-in versions thereof create a stream of initiatives without the necessary consistency and purposiveness. Here and there, in some classes or some schools – depending on those teacher-idealists – this will no doubt produce some progress: an extra lesson on the parliamentary system, a workshop about how to combat racism or take on controversial issues in a classroom, or a few days with a couple remembrance-education activities. Of course those are all fine. But this does not amount to much on a larger scale nor does it guarantee the social fractures and the global perspective will be in the front of our attention. Neither will the replacement of religious and ethic courses by one new theoretical course on religion, ethics-citizenship and philosophy, do the trick. One systematically overlooks two crucial insights needed to make any significant progress on a larger scale. One. Research by Marc Hooghe and others has proven what experts in the field of education already knew for some time: classical lessons on the political system are not as effective as projects (11) – a method to work on social issues, which does not downplay knowledge and direct instruction, but combines a knowledge part with a doing part, to account for the fact that in the moral domain the rational argument alone seldom works (12). Most teachers know the principles of project teaching and in most schools there are projects being done. But next to the fact that as an in-class didactic project teaching is very time consuming, most of these projects are too short in duration or below the necessary standards to be really effective. (14) The question therefore should already for a long time have been: how to organize project teaching so that all the relevant factors will mutually reinforce one another and citizenship will be given far more weight in the overall organization of the learning process? The answer also provides the key to the problem of scale: education systems will be able to, through their pedagogical services, stimulate in all their schools a generic and practical method for citizenship education, just as they did and do with OC (Research Competence) in the general strand and GIP (Integrated test) in the technical, professional and art strands of secondary education. The answer to that question is WELT. I will first describe how it works in general, then I will illustrate with an example. In the far left column of the table you can see the moral stepping plan WELT uses to organize the sequence of the participating courses, which should be as many as possible. 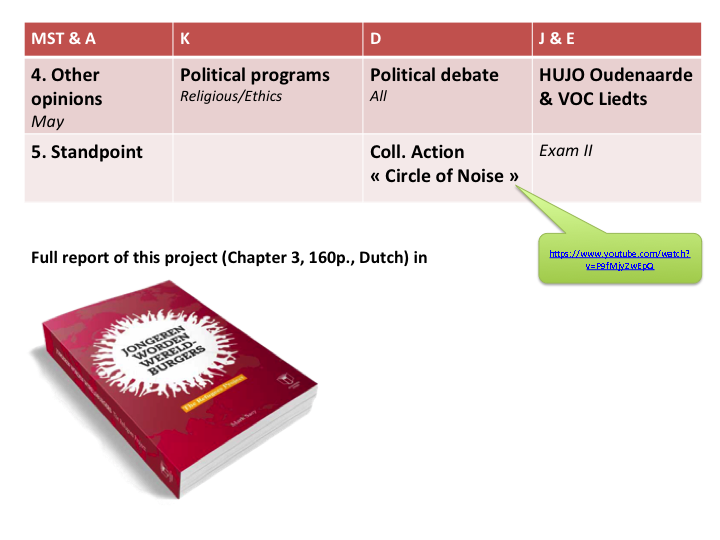 Each gets a two to three weeks period in which it connects its learning goals or end-terms to the theme of the project, after which the project goes to another course. That way there comes in the curriculum a 5 to 10% time layer to build a context for use for the integral learning of general or civic knowledge. I will shortly go over the different phases, then illustrate with some film scenes of one such project. The problem one chooses to work on should be a glocal problem on one of the social fractures. This also means it needs for its analysis sufficient knowledge of the economic, political, cultural and social dimensions of our global world. Once firmly in place and with the necessary enthusiasm there, the students and teachers consider possible solutions in the phase of values and alternatives, accounting for the acquired global perspective and value-frame of the UDHR. Together with the long-term duration of this type of trajectory, this clear distinction between a normative phase and the former more factual one, guarantees that students will have sufficient time and space to enter their own thoughts and the learning process will advance with respect to their ideas and opinions – the clause of non-indoctrination or ‘neutrality’. The next phase of other opinions (external experts, parents, politicians, activists, etc.) also ensures the democratic character of this type of problem-oriented and integral learning in which a well-built knowledge-line is being supported by a real life doing-part. 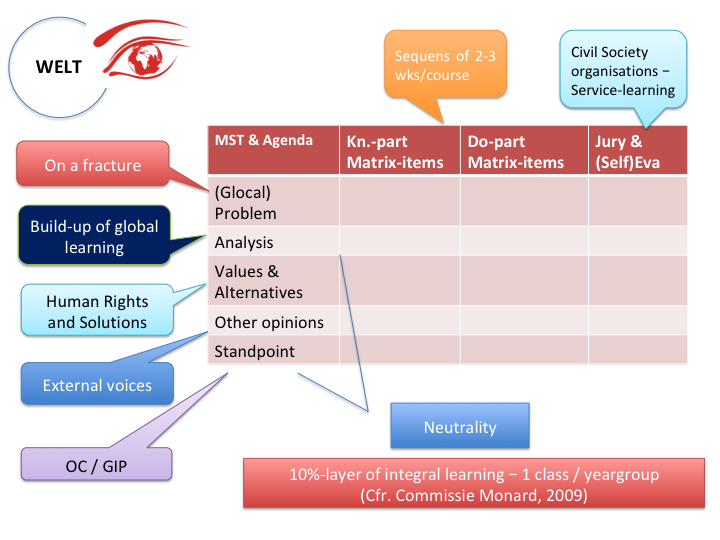 Both parts combined – organised with a moral stepping plan and connected in the axis of social fracture and global learning – will sufficiently cover all existing matrices of citizenship-education goals. This way WELT transforms the encyclopaedia of transversal goals and competences into a practical program that brings politics alive and directs student’s involvement towards politically relevant en meaningful ends, fully in accordance with the Rights of the Child and the democratic ethos of our constitution. At the end of the trajectory students formulate their point of view or conclusion, individually and/or collectively, in writing or finishing an installation they worked on, with a final action or a public performance. This way also OC (Research Competence) in general education and GIP (Integrated Test) in technical and professional education can be integrated and the evaluation and coaching more evenly divided among the teachers. WELT is in essence an improvement on OC and GIP, meaning the several educational systems that have these built in in every school, can in fact rather easily improve on citizenship-education on the largest scale. In the far right column you can see evaluation and jury. All marks for the several tasks and tests in the different participating courses count as instruments for evaluation. The jury is the name for the group of civil society organisations or local public services the WELT project collaborates with for subprojects and/or periods of service learning. Of course teachers will account for the feedback they receive from these organisations. As an in-class didactic for religious or Non-Confessional Ethics courses the WELT program can of course only deliver a miniature of what is here presented as a program to build extended schools for world-citizens. Equally clear is that in its totality this program only applies to the last three years of secondary education. For younger pupils the level of difficulty in the analysis and also the duration need to be reduced. School Without Racism has to that end already devised such a reduced WELT approach, called Beverzaken (A Matter for Beavers). But let this not ruin the importance of Non-Confessional Ethics. 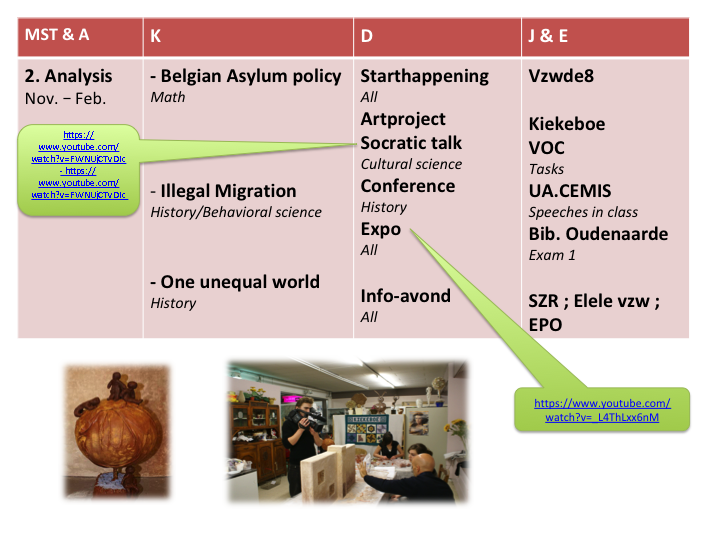 The fact that the stepping plan is now promoted in its new learning plan as general didactic, that also Citizenship has become a mandatory theme for every year and also Economics and Environment have been incorporated as general themes, make the ethics teacher the specialist and consequently the favoured colleague to initiate WELT projects in school. Imagine for a moment what this could mean to the status of the course. Let us now look at an example, phase by phase. The Refugees Project was done with an average class of 22 16 to 17 year olds and was the participating intervention study of the pedagogical value of what at that time (2007-8) was called learning trajectories for world-citizenship and now WELT. The 160 pages full report, including pre- and post-evaluation, you can read in Chapter IV of my book Jongeren worden wereldburgers (Young People become World-Citizens). Its theme was refugees and undocumented migrants and the social fracture open vs. closed society. To engage the kids and show them what would be the aim of their project, they first all watched Freedom Writers, a movie in which an English teacher uses project teaching to deal with an ethnically very divided group of pupils. At the end they were asked whether they also wanted to do something like that, a whole school year long. At the same time a paper went hand to hand on which was written a report by a doctor who visited dying refugees in an old house in a nearby city. The movie proved useful and the report gave them a good problem to work on. In spite of the fact that many differed in opinion on the theme, they all agreed and started to make all kinds of plans, which they divided over several working groups that would exist throughout the project. One of those would keep diaries on the project, so that changes in values and attitudes could be researched in depth. All these plans and little dreams made for a very good beginning. The phase of analysis would take from November until mid February and was divided in three chapters. At the Start-happening the film crew would film our guest speaker of the organization for refugees vzwde8 Sam Mampaey, who would teach the students the main facts and figures, laws and institutions, of the Belgian asylum policy. Also Claire De Potter of the local art workplace instructed the kids, with some examples of artworks they could make for the national art competition of School Without Racism, which that year had the same theme as this WELT project. After this introductory chapter the project took the students to an academic conference in Antwerp where several international experts on migration would reflect on their research. The students learned how illegal migration is in fact but a recent thing and became a concept only during the last stagnation-phase of the world-economy. At the conference they would also attend in small groups the working groups on the several dimensions and problems of the refugee question. They had to try and understand as much as possible and take notes, so that later in class they could exchange what they learned by means of a series of group speeches. At the conference they could also experience how many civil society organisations were active in this problem field and how the transfer of scientific knowledge proceeds. A second time they would all reflect on their enterprise during an info evening in one of the historical buildings of the small city of Oudenaarde. There they would show their parents and teachers the whole power-point presentation of their efforts and hand over the microphone to representatives of School Without Racism, the publisher of the book to be written about their story, and one of the organisations that would aid them with what would turn out be the most instructive and demanding part of the project: the interviews. They had to write down their interviews as part of a group assignment they could easily have entered as their OC (kind of a thesis in the last years of general education). The more than 15 interviews would make them think seriously about the distribution of wealth and the ways or points where asylum policy comes into conflict with human rights. In this they were supported by vzwde8 and UDEP, the organisation of and for undocumented migrants. In the knowledge part they had to read and analyse texts that normally would have been above their level but with this kind of teaching clearly posed less problems. Learning about the rights of refugees and democratic ways to protest injustices, the project took the students to an UDEP march in Antwerp in which also unions and other organisations participated. Considering the sometimes very different alternative models for an asylum policy, they entered into a long and difficult debate about the virtues and possibility of especially the social model that also demands taking on the global causes of migration and fleeing. To help them with that the doing part offered them a visit to the World Social Forum, which that year was also held in Brussels and where many organisations, that fight poverty and capital flight and make a plea for more international solidarity, were present. When the very last interviews were happening during the phase of other opinions, the students would analyse the program of several political parties and together with ex-students of the same school now members of Humanist Youth, prepare a real political debate between the local representatives of these parties. Also the town mayor and one former senator would be present in the small castle of the humanist centre. All those pupils who at the beginning of this project would have nothing to do with politics let alone political parties would now sit for more than two hours listening very carefully to what was being said and firing the one critical question after the other afterwards. The Refugees Project was the very first such project and via those images and lectures here and there WELT found its way to several organisations and schools. Today the public education system GO! and the city education system of Antwerp integrate it in their policies for citizenship education. But for this upscale to succeed we need something more. With a small group and a professional film crew we have set our minds on making a documentary on a next generation of WELT project. This documentary will be made for the pedagogical services of the several education systems and the teacher trainings, so that it would reach pretty much all schools and sectors involved with education. This new generation project will involve at its core in Antwerp 3 reference schools, one professional one general and one technical or art school, each working on a theme on one social fracture, taking a real problem in the city as their point of departure. But also working together on the construction of a Youth City Hall where at the end they will present their solutions and adventures to a large audience of citizens. We want as many transition-organisations as possible to collaborate in experimenting with old and new forms of citizenship. This way we would like to show how schools can create more solidarity in the neighbourhood and be the axis in a strategy to re-politicize civil society and protect democracy – that is: help rebuild the context for the use of civic or general learning. The first schools have already presented themselves but other schools and organisations can also join. We need all the help we can get and welcome everyone who wants to work with the WELT program. So, if in professional education 3 colleagues teaching the same year in the same school or in general and technical/art education 5 colleagues are willing to set up a WELT project, please let us know via the www.civiclab.be contact address. For an overview of Wallerstein’s world-systeemanalysis, see Saey M. (1995): Wereld-Systeem Analyse. Een Antwoord op 1968, Brussel: IMAVO. Klein N. (2014): No Time. Verander nu, voor het klimaat alles verandert, Breda: De Geus ; De Witte L. (2017): Als de laatste boom geveld is, eten we ons geld wel op, Berchem: EPO. Oxfam (2017): An Economy for the 99%, via https://www.oxfamsol.be/nl/8-rijkste-mannen-bezitten-evenveel-als-armste-helft-wereldbevolking. Piketty Th. (2014): Kapitaal in de 21ste eeuw, Amsterdam: De Bezige Bij. Wilkinson R. and Pickett K. (2010): The Spirit Level. Why Equality is Better for Everyone, London: Penguin Books. Blommaert J. (2007): De crisis van de democratie, Berchem: EPO. Oudenampsen M. (2018): The conservative embrace of progressive values, to be published. The next three paragraphs are based on Saey P. En Saey M. (2004): Back to basics. Het Vlaams Blok: schoppen naar beneden, in: VMT 38/3, pp.6-18. For all facts and numbers, see the overview of reports in Saey M. (2014): Jongeren worden wereldburgers, Gent: Academia Press. A recent study by AHOVOKS however concludes that for knowledge on average 80% of last year students reaches the endterms for citzenship. This conclusion not only goes against most other research but is also highly controversial for several reasons: that kind of average on a test covering so many subjects raises serious questions with every teacher, released examples of the questions also show a low level of difficulty, some even are biased, and several of the main endterms for citizenship weren’t tested. Its conclusions on values and attitudes on the other hand were in line with most other research: “Still it remains remarkable that so many students say not be so competent when it comes to citizenship themes” (Peiling burgerzin en burgerschapseducatie, ond.vlaanderen.be/curriculum/peilingen, 2017). How to accord this with the results or conclusions on the knowledge part, the report does not explain. Hooghe M. (Red.) (2012): Jongeren, politiek en burgerschap, Leuven: acco. For an overview, see Van Vaek J. (2013): Cursus Inleiding tot de Axiologie, Antwerpen: Artesis Plantijn Hogeschool. Cfr. the TOR reports in Saey M. (2014).